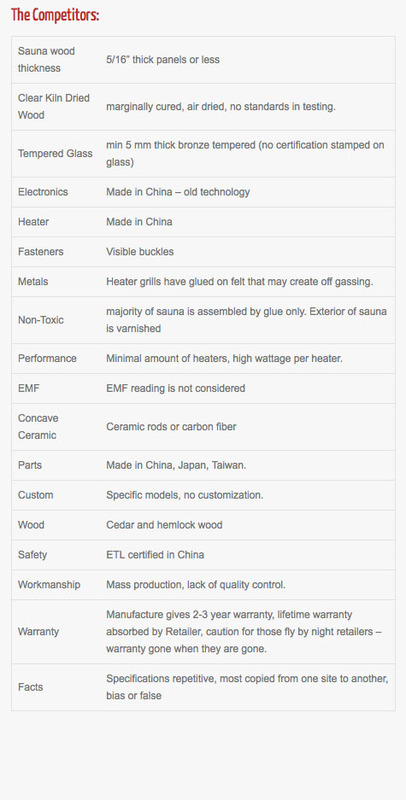 Infrared Sauna Quality Around the Technology. This is a complete guide that is intended to help the uneducated buyers sort through all the hype, mumble jumble, false claims, and all the other bias facts that are surrounded by many of the websites and retailers selling infrared saunas. 3.Who will back up warranty? 5.Is the product safety certified? 6.How thick is the wood? 7.Where is the wood from? Many buyers are purchasing infrared saunas from various sauna retailers. Buyers are finding that months later after their purchase if problem occurs, they are finding themselves out of luck when its time to replace or find that specific part to repair their sauna when it fails. This is the unfortunate situation that is happening to many infrared sauna buyers across Canada and USA. There are many new companies popping up across the country importing infrared saunas from China, having the Chinese manufacture put their name on the products. Unfortunately majority of saunas from China extremely resemble each other from manufacture to manufacture. Even though this is the case, the overall image or model is close to being identical in looks, does not mean the parts to build the sauna are identical. Plugs, wire harnesses, keypads, heaters, wood, doors, hinges, control boxes, etc…. are all different and will not work with each between the different manufactures. So if the retailer you purchase from is a “fly by night”, disappears, out of business, how will you repair your sauna? Your LIFE TIME WARRANTY is gone just the same. Many, many, customers are being stranded and left on blind searches for compatible parts to repair their sauna. Many are out of luck. Caution to whom you purchase from. Find out how long the retailer is in business, if they make their own parts, if they are the manufacture. Buyers Beware. Few things to look out for when purchasing a new infrared sauna. Wall Construction: Saunas that use exterior buckles and clips compensate for misalignment hardware, sloppy tolerance limits, and poor workmanship. Shortfall from mass production. Walls do not quite meet properly, but they still can be forced together since the loop or tongue of the buckle is over 1” wide that can allow for tolerance gaps. Walls which are forced together will warp or bow over time. Buckles give the appearance of cheap quality. Wall construction is an obvious part of the sauna which determines the quality and value in an infrared sauna. This where many offshore manufactures cut corners. Most manufactures have a double wall (inner and outer) that are only 3-5mm thick (5/16” max). Thin walls do not hold up to the wide swing in temperature ranges required of a sauna. Thin walls are much more likely to warp, crack, chip, splinter, twist or develop bows over time. The thin walls also dissipate heat. Infrared saunas should be kiln dried to about 10% moisture content to prevent warping. Low priced saunas generally use thinner and low margin cured woods. Also, very important fact, amount of heaters in the sauna and the type. This has to be done visually. Do not just go by overall wattage output of the sauna. Many saunas are built with higher wattage heaters, but with only a few of them. This cuts back on the cost of parts and influences overall performance. Low wattage, more heaters is the main goal, followed by quality of heaters. Max coverage by concentrated infrared producing heaters, at a 96% efficiency is what makes a great performing infrared sauna. Cheap saunas have poor structured flooring that sag and buckle when significant weight is placed on them. Find the overall weight of the sauna. Light weight saunas can easily be slid across the room by one person with very little effort. 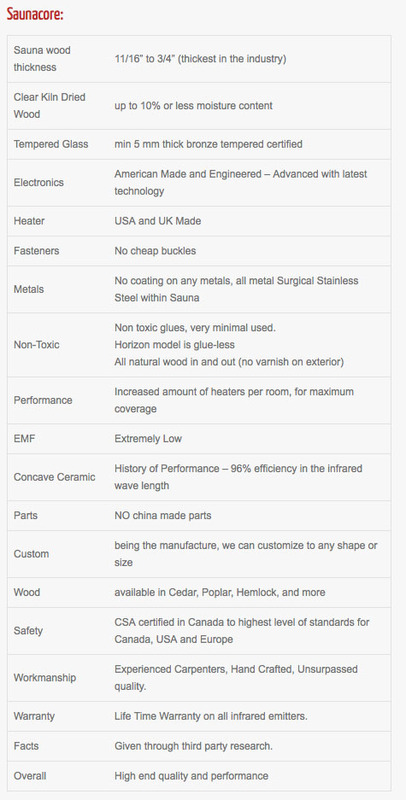 All this equals thin wood, thin metals, cheap parts, fewer parts, etc…. 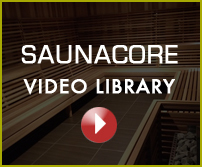 SAUNACORE produces state of the art, well-constructed, advanced engineered, precision hand crafted infrared sauna, at commercial grade levels of durability.